The Royal Garden Party Plans are in Full Swing! Finding a gift for the person who has everything can be a challenge. That’s why we’ve introduced our bespoke engraving service. Choose from any of our stone products and we’ll work with you to engrave your message and create a present to last a lifetime. All of our stone is sustainably sourced by us from the beautiful rainbow sandstone to the pearlecent hues of our shark sandstone. Each product is hand finished – making each one unique and perfect for that hard-to-buy-for friend or loved one. 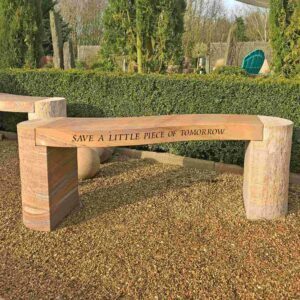 Once the stone arrives with us at our Stowbridge show room it is displayed in our show garden for you to come and choose the piece that matches the person you are buying for. 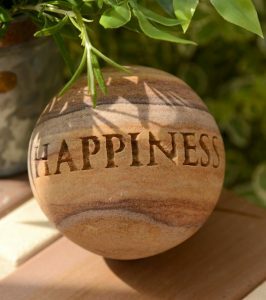 When you’ve chosen your piece we’ll work with you to choose from a variety of fonts and we’ll send you a sample of the design before it is engraved right here in Norfolk. Our team of artisan engravers will use only the best technology to achieve razor sharp lines and smooth curves in the stone. 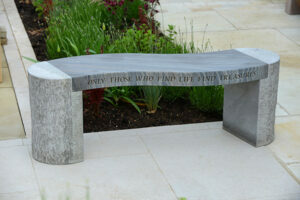 We’ll then infill the font to ensure the text stands out against the colouring of your stone. Submit Your Foras Photos For a Free Gift! Sign up to our mailing list to receive future exclusive offers. © 2019 FORAS. All rights reserved. We want to give you 10% OFF your first purchase! Sign up to our mailing list to receive your discount code and get future exclusive offers.